Maybe it was the recession. Maybe the golden parachutes. Perhaps there's too much pressure now at the top. It seems to us there has been an unusually high turnover among chief executive officers at leading food & beverage companies over the past 14 months. Dividend yield is very important to super investor Warren Buffett. His No. 1 holding, at 24.1 percent of the total portfolio, is Coca-Cola, which yields 2.8 percent. Kraft Foods, 6.7 percent of his portfolio with a 4.7 percent yield, is his big food gamble. He also trimmed it after saying the Cadbury deal was too expensive, according to The Street. With shares at $30.65 (at press time), there is an implied upside of over 14 percent to the consensus price target objective of $35.06. Kraft is not overly expensive as it trades at about 14-times forward earnings expectations. The good thing about this DJIA component is that it offers investors a dividend yield of about 3.8 percent. The last time shares were above $35 was in 2006 and shares traded in a range of $35 to $40 in 2002. Since November of 2009, we count six new CEOs (plus two divisional CEOs, three COOs and three unit presidents) among the 37 largest U.S. and Canadian food & beverage companies (as ranked by the Food Processing Top 100©). Interestingly, six in this story have taken over just this year. It looks like the baby boomers are taking over. Between 46 and 65 years old, those postwar babies are in their prime to be leading companies. However, one CEO included in this report – John Bryant at Kellogg – is one year too young to even qualify as a boomer. A generation some 76 million strong, the first wave of baby boomers turned 65 on Dec. 25. According to Pew Research Center, the typical boomer feels nine years younger and thinks "old age" starts at age 72. It's no wonder many are vigorously ensconced in their career success and continue to lead their companies to success. At the same time, we see several choosing to retire early to spend some quality years enjoying the fruits of their labors. Of the leaders we highlight -- three are foreign-born — from Britain, Australia, Spain. Three are veterans of Proctor & Gamble's world-famous management training program, most have international experience and, unlike our 2008 report, which included two new female chief executives, all are men (Denise Morrison, CEO-designate at Campbell Soup, took a last-minute pass on this story, Sarah Robb O'Hagan of Gatorade is featured). By the way, there remains a job opening at the top of Sara Lee, in case any of you are interested. 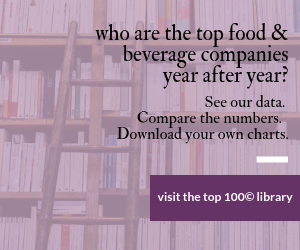 We asked them to give us outlooks for the whole food industry on the year ahead and for their companies, and to hint at some of the changes they'll be making now that they are in charge. Joseph E. Scalzo, Dean Foods Co.
J. P. Bilbrey, The Hershey Co.
Two of the biggest animal protein companies in the U.S. were bought by Brazilian firm JBS S.A. in recent years. First was meat packer Swift & Co. in 2007. When Pilgrim's Pride Corp., at one time the continent's largest poultry company, sunk into bankruptcy at the end of 2008, JBS bailed it out a year later by acquiring 64 percent of its stock (now 67 percent) and edging out much of the Pilgrim family ownership. Maybe it was too much for a Brazilian national to handle. While Wesley Batista, son of the Brazilian firm's chairman/CEO, remains chairman of both American units, he picked Don Jackson, CEO of Pilgrim's Pride, to be CEO of JBS USA, Greeley, Colo., effective last month. To fill Jackson's role at the poultry firm, William Lovette was hired away from Case Foods Inc., another poultry processor. Jackson, who received his B.S. from Arizona State University and his master's and doctorate from Colorado State University, just became Pilgrim's Pride's CEO two years earlier as it began the Chapter 11 process. Before that, he spent 22 years at Seaboard Farms of Athens, Ga., and four years as CEO of Foster Farms' poultry division in Livingston, Calif.
Jackson should re-establish an American tone at a company that's had much South American influence over the past three-plus years. "He's led an incredible turnaround at Pilgrim's," says Gary Rhodes, Pilgrim's Pride's vice president of corporate communications and investor relations "He joined us weeks after we filed bankruptcy and … he helped direct the successful reorganization of Pilgrim's and helped reposition the company as a leaner, stronger competitor in the chicken business." With more than 27 years of poultry industry experience, Lovette looks like a good replacement for keeping Pilgrim's Pride (www.pilgrims.com) in the black. He had been president and COO of Winesburg, Ohio-based Case Foods. He previously spent 25 years with Tyson Foods in various management positions, including president of its international business unit, president of its foodservice business unit and senior group vice president of poultry and prepared foods. "He has a deep knowledge of the poultry business and the market environment, and we believe he will lead Pilgrim's to continued growth and profitability," says Jackson, to whom Lovette will report. Golden State Foods is one of those stealth food processors. Despite having $4 billion in sales, you won't find its name on anything; you won't even find its products in a grocery store. But you will at McDonald's restaurants. It helps the Golden Arches shine with products including beef patties, Big Mac sauce (which it helped formulate), buns, ketchup and mayonnaise. Golden State distributes goods to more than 20,000 quick-service eateries from 20 distribution centers. It helped launch McDonald's in international markets, which currently span more than 120 countries, and has diversified with 50 more customers since 1967. And up until last December, it was run by a small group of insiders at Wetterau Associates, the investment firm that owns it, with Mark Wetterau remaining Golden State's CEO. With a number of retirements and other changes at the top, Golden State, Irvine, Calif., plucked ingredient supplier Sensient Technologies' president/COO Neil Cracknell, to be Golden State's executive vice president and COO. A graduate of England's Loughborough University with a B.S. in human biology, Cracknell earned his MBA from the University of Bath. His whole career has been at Sensient, starting in sales and marketing in 1994 at Sensient Food Colors Europe. He became vice president of pharmaceutical technologies at Sensient Colors Group, division president at Sensient Dehydrated Flavors Group, president of Sensient Flavors and Fragrances Group and then president and COO at Sensient Technologies. So while new to Golden State, Cracknell has watched the pulse of the food industry for years. "2011 will see an increasing focus in the food industry on nutrition and sustainability," he told us. "As the nutritional demands of consumers change, there are tremendous opportunities for us to demonstrate our expertise at formulation, whether it is reformulating an existing product with a lower sodium content or developing entirely new products, such as beverages. "As [foodservice] customers look to enhance the sustainability of their supply chain, we have a tremendous opportunity to innovate in our facilities, through new practices or technology, to improve the efficiencies and security of our supply chain. "Food safety will continue to be a paramount priority in the coming years within the foodservice industry," he continues. "Thus, GSF has chosen to certify its manufacturing plants through BRC accreditation as part of its global food safety initiative." As a relatively new COO, what changes does he plan to make? "Building on GSF's values-driven success for more than 60 years, my goal as COO is to continue to drive profitable growth, while maintaining those values which have made us successful decade after decade," he says. "One of the main challenges is managing that growth, particularly with our 1,000 new associates and hundreds of new positions created over the past year; it is a period of dynamic evolution at Golden State. One of the great strengths of the company that I have observed so far is the ability of the team to take on new challenges and accept growth-related change as the company has evolved." How will Golden State maintain growth? "We must continue to provide innovation in product and service to our customers, while delivering industry-leading standards of quality and service," he responded. "We will certainly review opportunities to enter new product and geographic markets. In particular, we see significant opportunities for GSF to expand globally. Likewise, we will continue to develop our people at GSF, expanding our GSF University training and education program internationally, a wonderful tool to ensure that our associates are equipped to deal with tomorrow's challenges." Del Monte Foods [which has since announced plans to go private], which produces, distributes, and markets branded food and pet products for the retail market in the U.S. Its Consumer Products segment sells branded and private label shelf-stable products, including fruit, vegetables and tuna products. The Pet Products segment offers branded and private label dry and wet pet food, as well as pet snacks. The company's plan to boost sales and earnings growth is on track. Del Monte's reorganization efforts included a shift in its sales mix to higher growth and higher profit margin products: snacks and pet food. Those efforts also produced impressive productivity gains. In addition, the company showed investors that it will be returning value to shareholders. It recently announced that it was going to increase its dividend by 80 percent and buy back up to $350 million of its shares over the next three years.In the last three quarters, Del Monte beat the Zacks Consensus (of analysts) by an average of 58.1 percent. Hormel Foods, which produces and markets meat and food products in the U.S. and internationally, offers meat products, including fresh, frozen, cured, smoked, cooked and canned. The company provides perishable meat products, which include fresh meats, sausages, hams, wieners and bacon; and shelf-stable products such as lunch meats, chili, hash and stews. It has a balanced portfolio of grocery products, refrigerated foods and Jennie-O Turkey. By not relying on one product line, the company is able to better manage its business. Hormel's refrigerated foods and Jennie-O Turkey sales are performing well, with Jennie-O's operating profits climbing 93 percent year-over-year. Growth in those segments more than offsets Hormel's grocery business, where its Spam and Bacon Bits products are dealing with higher input costs. In the last five quarters, the company has beaten the Zacks Consensus by an average of 14.3 percent. J&J Snack Foods, which manufactures nutritional snack foods and distributes frozen beverages to food service companies and retail supermarkets in North America. The company primarily offers soft pretzels, frozen juice treats, desserts, churros and baked goods to snack bars and food stands. JJSF's frozen carbonated beverages (FCB) and soft pretzels are driving the company's solid growth. FCB is a high margin business that is experiencing solid momentum. Meanwhile, soft pretzels, which suffered in recent quarters because of price increases, appears to have stabilized, and there has been an uptick in its sales to malls, theme parks and sporting events. In the last five quarters, JJSF has beaten the Zacks Consensus estimates by an average of 25.6 percent. Treehouse Foods (our Processor of the Year) which operates as a private-label food manufacturer serving the retail grocery and foodservice channels in the U.S. and Canada. The company's products include non-dairy powdered creamer, soups, broths, infant feeding products, salad dressings and jams. Its brands include Peter Piper, Hoffman House and Nature's Goodness. Private-label is a large but fragmented industry, generating over $60 billion in annual sales, and over 80 percent of the companies in the business are small, privately-held firms. This gives Treehouse, which has been a consolidator in this space, the opportunity to produce solid and consistent earnings growth for the next several years. In the last five years, THS has acquired four companies and plans to continue its growth-by-acquisition strategy in the future. In the last five quarters, Treehouse has beaten the Zacks Consensus estimates by an average of 18.9 percent. Jim Clough, Schwan's Food Service Inc.
Jose Louis Prado, Quaker Foods and Snacks N.A. EVP: Sam Rovit, Kraft Foods Inc.